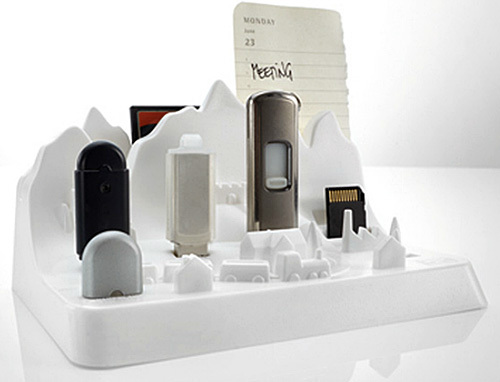 Memory City Turns Your Flash Drives Into A Miniature Metropolis | OhGizmo! If you’re anything like me, you’ve probably got a desk covered in random flash drives that once contained instruction manuals, images or press kits. They end up getting randomly used throughout the day, which is why mine never get stashed away in a drawer. And occasionally, one will go missing. So here’s a novel way to wrangle a handful of your flash drives and memory cards. 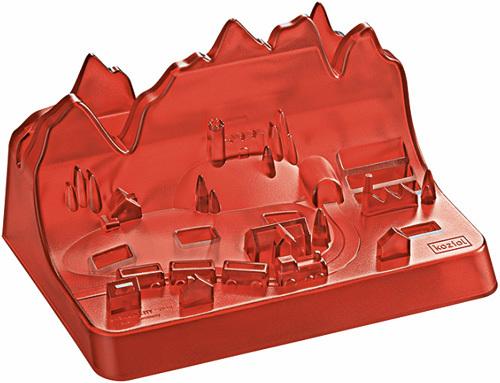 Memory City can hold up to 4 USB flash drives, turning them into towering skyscrapers and architectural masterpieces in a miniature town. There’s also room for 3 SD cards, 3 microSD cards and the best feature of all, 3 places to store flash drive caps because we all have a few that haven’t gone the retractable route yet. Available from design3000.de for ~$14 (€9.95) in red or white.